Occasionally, you will hear the ambient reverb of sound-systems playing and citizen shopping at the corner shops in the areas which give visitors the authentic feeling of a real community. It’s safe and it’s a great experience to live and learn our Jamaican culture and it’s just 15 minutes drive to the city centre. It's the coolest hostel in Kingston.This hostel offer you the opportunity to Stay & Live an unforgettable experience in Jamaica, taking dance lessons with the best local dancers while visiting the beaches, historical sites and parties. Corner shops are across the street and a easy 10 minutes walk to supermarket and restaurants. 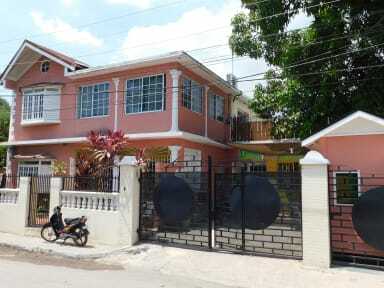 The Dancehall Hostel is located on the same property of the renowned Cell Block Recording studio. It consist of 2 large dormitory fitted with bunk beds in each. Its also have a common room and fully equip kitchen. There two other bedrooms which can be private and a third one which is a studio flat with kitchenette and own bathroom. All rooms carry air conditioner unit and internet Wi-Fi. Solar-heated shower in shared bathrooms. Private 2 bedroom apartment downstairs as well. Laundry room, cable tv & free storage lockers are provided. Check in and Check out at anytime.